Home > Indoor > Residential > Apartament in San Sebastián. The Arquitecura-G studio received the commission to convert a home in a block of flats surrounded by parkland in San Sebastián into a roomy and comfortable space in the style of a hotel suite, in which to hold occasional family reunions. The project involved modifying the dwelling, initially consisting of a living-room of modest dimensions, a 12 metre-long corridor and 5 bedrooms in which the owner had lived with her 3 daughters, in order to create a living space of natural materials, easy to move around in and benefitting from abundant natural light and lush greenery supplied by picture windows. The different spaces were configured principally by the materials employed. 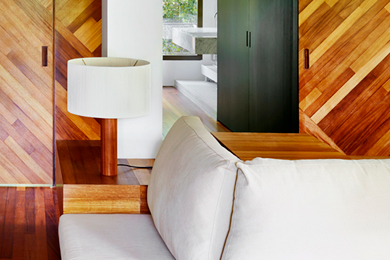 The floor, laid with brown ceramic tiles, defines the circulation and adds warmth, as do the wooden panels made of solid iroko which cover the floors and walls of the bedrooms and living-room. These panels, of different hues and set at different angles, form a composition which is at once dynamic, colourful and natural and which combines perfectly with lamps designed by Santa & Cole, Moragas and TMM. 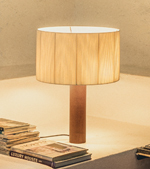 The Moragas lamp, placed in the living-room beside the sofa of the same colour as the lamp’s pleated shade, was designed in 1957 by the rationalist architect Antoni Moragas Gallissà. This classic design, formed by a solid wood cylinder and a circular shade, fits pleasantly and harmoniously into this space. 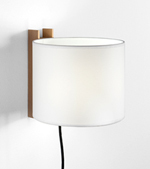 Miguel Milá’s TMM wall lamp was chosen to provide light in the bedroom so as to contrast with the wood-panelled walls. It is of simple design, comprising a beech-wood channel and a parchment shade. Both models are part of Santa & Cole’s Design Classics Collection, a set of objects created during different periods of contemporary design that propose a critical debate on creation in industrial design beyond fashion. This collection connects distinguished designers of the past such as Arne Jacobsen, Ilmari Tapiovaara and Miguel Milá with new users. The result is an exclusive, modern apartment adapted to the owner’s new lifestyle with total comfort. Arquitectura-G is an architecture firm based in Barcelona that is dedicated mainly to building and teaching. Founded in 2006 by the architects Jonathan Arnabat, Jordi Ayala-Bril, Igor Urdampilleta and Aitor Fuentes, it has received several awards and recognitions, including the 2013 ASCER Interior Design Prize, the 2015 Mies van der Rohe Emerging Architect Award, the Prize of the 13th Spanish Biennale of Architecture and Urbanism in 2016, and the 2016 Architecture Prize of the Counties of Girona. It was also selected to participate in the Spanish Pavilion at the 2016 Venice Biennale.